The Customs Department says the cocaine seized during an operation at the Montego Bay Cruise Ship Pier in St. James on Wednesday has been valued at more than $100 million. A statement from the Department says 50 pounds of cocaine was found following the five hour operation. It involved personnel from Customs and a team from the Trans-National Crimes and Narcotics Division of the Jamaica Constabulary Force. 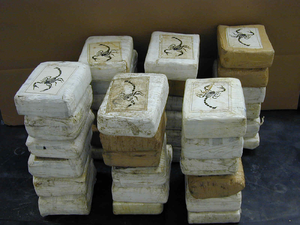 According to the statement, 22 pounds of cocaine was found strapped to a man who has been identified as Ricardo Chin. Mr. Chin was a passenger on a cruise ship that had docked at the pier. Another 28 pounds of cocaine was found in a suitcase in a cabin occupied by a second passenger on the ship. The cruise ship had arrived from Colombia. Mr. Chin has been taken into custody and will answer to charges of breaching the Dangerous Drugs Act, the Proceeds of Crime Act as well as the Customs Act. The Customs Department says the cocaine seized during an operation at the Montego Bay Cruise Ship Pier in St. James on Wednesday has been valued at more than \$100 million.